(a) Energy levels of Ca+ as a quantum bit. (b) Magnetic sub-levels: splitting of D5/2<span style="mso-spacerun: yes;"
Decoherence-free state: cancelling magnetic field noise. The excursion of the magnetic field, normally a notable source of uncertainty in measuring the transistion energy, is reduced in this case since the levels shift in opposite directions. Psi represents the compound wavefunction for the two-ion quantum state. 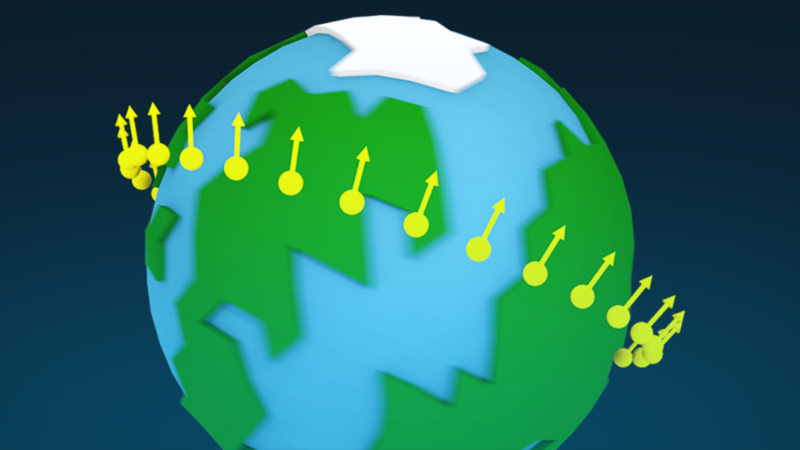 The orientation of the atom trap changes throughout the day as the apparatus rotates along with the earth. A new experiment conducted at the University of California at Berkeley used quantum information techniques for a precision test of a cornerstone principle of physics, namely Lorentz invariance. This precept holds that the results of a physics experiment do not depend on its absolute spatial orientation. The work uses quantum-correlated electrons within a pair of calcium ions to look for shifts in quantum energy levels with unprecedented sensitivity. JQI Adjunct Fellow and University of Delaware professor Marianna Safronova, who contributed a theoretical analysis of the data, said that the experiment was able to probe Lorentz symmetry violation at the level comparable to the ratio of the electroweak and Planck energy scales. These correspond, respectively, to the energy scale of the universe at which the electromagnetic and weak forces become comparable in strength, and the scale where gravity becomes comparable in strength to the other physical forces. The Lorentz symmetry is fundamental to both the standard model of particle physics and general relativity. However, the theoretical effort aimed at unifying gravity with other fundamental interactions suggests that Lorentz invariance may not be an exact symmetry. Moreover, it may be possible to detect minuscule Lorentz-violating effects at the experimentally accessible energy scales. Thus, Lorentz symmetry tests such as carried out at Berkeley may provide a low-energy window into the possible scenarios of theories beyond the standard model and general relativity. Safronova notes that tabletop experiments such as the Berkeley effort complements direct searches for new physics conducted at high-energy labs such as the Large Hadron Collider. The Berkeley experiment did not detect any telltale shifts in energy levels. However, the importance of probing the efficacy of the Lorentz principle is so great that even a null result at high sensitivity is notable. The scientists use the data to establish that no shifts in the behavior of electrons (and hence no evidence of Lorentz-violating effects) were observed at a sensitivity of one part in 1018. This is some 100 times better than the best previous measurements. The experiment also improved by a factor of five the assertion that the speed of light is isotropic (equal in all directions). All these results of the Berkeley experiment are published in the 29 January issue of Nature magazine. The authors include UC Berkeley team of Hartmut Häffner, Thaned Pruttivarasin (now at the Quantum Metrology Laboratory, RIKEN, Japan), Michael Ramm, and Michael Hohensee (now at the Lawrence Livermore National Lab); Sergey Porsev at the University of Delaware and PNPI, Russia; Ilya Tupitsyn from the St. Petersburg State University in Russia and Marianna Safronova, JQI and the University of Delaware. The Berkeley experiment imposed stringent limits on the Lorentz symmetry violation in the same way that the classic experiment conducted by Albert A. Michelson and Edward W. Morley in 1887 ruled out the existence of subtle “aether” fields. In those years scientists supposed that light waves, like all then known waves, had to propagate through an underlying medium---as ocean waves roll through water and sound waves are pressure waves moving through air. To look at the status of aether, Michelson and Morley broke a pulse of light into two parts, which then took equal but perpendicular paths. Reflecting from mirrors these pulses were recombined to form an interference pattern. The apparatus’ (riding on the Earth around its orbit) moving through the presumed stationary aether would impose a slightly different pathway for the two beams. This in turn would shift the interference pattern, heralding the aether. No shift was discovered, supporting Albert Einstein’s later assertion that the aether does not exist. The Berkeley experiment does the same thing for electron waves for an apparatus that rotates around along the Earth in its daily revolution. According to modern field theory, all particles including atoms, and the atoms’ own constituents such as electrons, can be thought of as fields, variations in the likelihood of quantum energy being present at various places and times. Lorentz invariance might, in principle, have a different standing for each of the known fields. The Berkeley experiment may be interpreted as test of Lorentz invariance for either electrons or light. The electrons in question are the outer electrons of calcium ions maintained in an electric enclosure called a Paul trap. 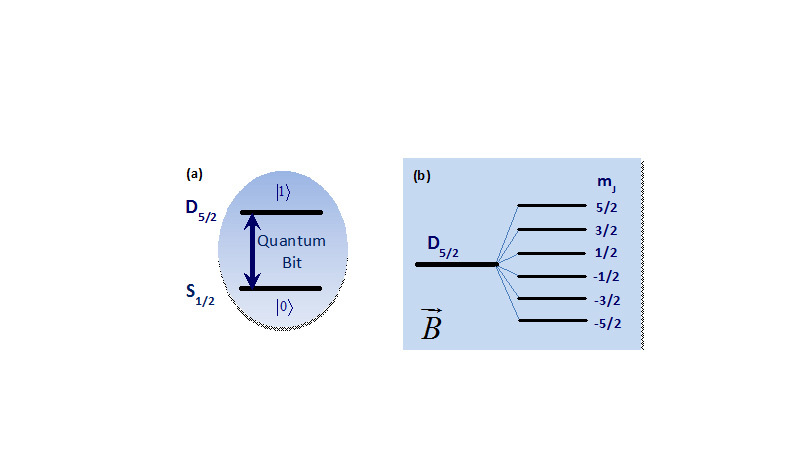 In quantum information experiments energy levels of calcium ions serve as the basis for quantum bits, or qubits, as depicted in Figure 1a. Such atomic qubits can be manipulated with laser beams into residing in a superposition of two discrete levels simultaneously. In the trap two ions 16 microns apart are exposed to a static magnetic field. In a process called the Zeeman Effect, the magnetic field causes the internal quantum levels of the ions to split into finely spaced sub-levels. These subsidiary levels are designated by the possible z-component of the magnetic moment labelled mJ. For a calcium ion the outermost electron is in a state called D5/2, meaning that the electron is in a D orbital (the probability of the electron being in space is highest along a dumbbell-shaped surface) and the total electron angular momentum J has a value of 5/2 units. Turning on a magnetic field splits what was a single quantum energy level into six sub-states identified by the strength of the electron’s magnetic strength along the direction singled out by the external magnetic field as shown in Figure 1b. The six values are designated as +5/2, +3/2, +1/2, -1/2, -3/2, and -5/2. One of the biggest potential sources of uncertainty in the measurement of the transition between the two states is introduced by the tiny fluctuations in the strength of the external magnetic field. Since the energy spacing of the sub-levels is directly proportional to the magnetic field, any noise in the field translates directly into noise, or uncertainty, in the measured energy levels. 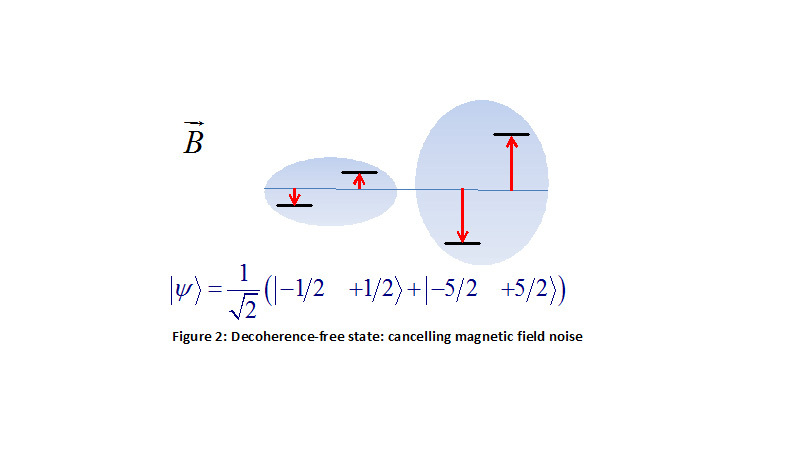 To counteract magnetic noise and to make their measurements as sensitive as possible, the physicists use not a single ion, but two correlated ions in the quantum superposition of (-1/2, +1/2) and (-5/2, +5/2) states as shown in Figure 2. By using two quantum-correlated ions, magnetic noise can be minimized since fluctuations would produce cancelling effect on such pairings of qubit configurations. Construction of such “decoherence-free state” has been developed for quantum information applications. As a result, the electron wavefunction (denoted by the Greek letter psi) of the two-ion object (or the wave packet) is in a superposition of ±1/2 and ±5/2 states. This condition is allowed to last for about 93 milliseconds. During this time, because they have a different spatial orientation, the 1/2 part and the 5/2 part of the wave packet will evolve differently if a spatially-anisotropic, Lorentz-violating effect is at work. This in turn will subtly alter the nature of the superposition of the two-ion state. That fact, coupled with the motion of the atom trap through space as the Earth rotates over its daily period, would create an interference effect in measurements of the status of the ions if a spatial-orientation-dependent force were there. The lack of any observed interference suggested that there was no Lorenz-violating effect, at a sensitivity down to a level of 11 millihertz (times Planck’s constant). This translates into a Lorentz-violation sensitivity of one part per 1018. Could the Lorentz-violating effects be there after all, but at a harder-to-measure magnitude? Scientists are compelled to keep looking as such observation would be unambiguous evidence for new physics. “We believe we can achieve much higher sensitivity, maybe by a factor of 10000,” said Safronova, who is an Adjunct Fellow of the Joint quantum Institute and a physics professor at the University of Delaware. “This could happen by using ions that are more sensitive to Lorentz violation, such as Yb+ or certain highly-charged ions and by recording measurements over a longer period.” JQI’s Christopher Monroe is using trapped Yb+ ions for his forefront quantum information research.